While many children fall in love with baseball at an early age, Austin Hedges was drawn to a specific part of the game. Beginning when he was only 3 years old, Hedges said he always loved catchers because the gear they wore looked cool. Hedges is a fine athlete. He played point guard in basketball through middle school, but stopped when he got to high school to focus on baseball year-round. In 2011, he graduated as an A student from Jserra Catholic High School in San Juan Capistrano, California. He had a a commitment go to UCLA on a baseball scholarship. But the Padres drafted him, and he went pro. In 2013, Baseball America rated Hedges as the 4th-best prospect in the Padres' organization. But in the winter before 2014 spring training, they had Austin as the #1 prospect in the Padres' farm system. They dropped Austin to 4th-best in the winter before 2015 spring training. Austin said his favorite major league catcher of all-time is Ivan Rodriguez and he loves watching Yadier Molina pick players off at first base. But, the catcher he admires most is JSerra head coach Brett Kay. Kay went to the College World Series twice with Cal State-Fullerton between 1999-2001 and was an eighth-round draft pick by the Mets in 2001. He spent three years in the minor leagues before beginning his coaching career. "Basically, everything I know now is from him," Hedges said. "Between teaching me receiving, catch-and-throw, blocking pitches, even calling pitches, it's all him." Hedges loves putting in the hours to fine-tune his game, whether it's working on his footwork on throwing down to second base or learning the intricacies of pitch selection. Hedges lives and breathes baseball. Austin spent six years honing his defense with highly regarded JSerra coach Brett Kay, a former catcher at Cal State Fullerton and in the Mets system. And, near the end of the 2013 season, Hedges said that he still enjoys the game as much as he ever has. "I've always dreamed of making the big leagues, but also it's the most fun I ever have in life. So I'm always happy to be out here playing the game," he said. Hedges loves watching big league games, and naturally it’s the catchers who draw his attention: how they set up, how they receive, how they throw—but, above all, how repetitive they are about all of it. It’s all very inspiring. Austin is a baseball rat. He studies the game and has a very high aptitude for it. He sees things a lot of players, even catchers, don't see. He sets very high standards for himself. He loves earning the trust of his pitchers. It is much deeper than giving signs for what pitch to throw. It's about something deeper, something much more visceral. "When a guy shakes me off, I want to be able to communicate to him and get him to trust me," Hedges said. "I think the best advice I've gotten so far is that the wrong pitch with conviction is better than the right pitch without conviction. I always try to think of that. If the pitcher knows his slider is good, then you throw it the best you can. That's always better than, say, a mediocre fastball. "It's getting the full trust out of your pitcher. That helps to develop our relationship." 2016 Spring Training: As a 22-year-old in the big leagues for the first time, there were, as you might expect, many times in 2015 when Padres catcher Austin Hedges wished he could slow the game down. "It's not that easy, though," Hedges said. "There are only so many ways that you can slow the game down." Hedges may have found another way. Hedges and Padres strength and conditioning coach Brett McCabe started playing with a pair of Nike strobe glasses in the offseason, after Hedges saw Golden State Warriors' guard Steph Curry using them for drills, dribbling a tennis ball with one hand and a basketball with the other. The two have devised a way for catchers to use the glasses during drills, with the intent of overloading the central nervous system and improving read-and-react time. The glasses offer eight different settings (easy to difficult) that control how long the lenses are open, as they flicker from clear to opaque. The drill the team has used this past week involves the catcher facing a wall in his crouch as a coach stands behind him with a tennis ball. The coach bounces a tennis ball off the wall with the catcher attempting to grab it with his bare hand. "Since you don't know where it's coming from, you've got to kind of react to it," Hedges said. "Honestly, it's one of the few drills I've ever done that when you put the glasses on it actually slows the game down. Doing it without [the glasses on] is tough enough, doing it with is really hard. But when you take the glasses off, it's like slow motion. So the drill becomes really easy." Hedges said that once the glasses are removed, trying to catch that same tennis ball almost looks like a beach ball. McCabe said it took between four and six weeks to find the best way to use the glasses to help catchers. McCabe said the team hasn't ruled out having position players use the glasses during some hitting drills. Hedges already thinks the glasses are a hit, and he plans to keep using them throughout camp. Austin said he benefited from spending much of the 2015 season on the Padres’ bench as a backup to Derek Norris. Austin has been a UCLA basketball fan his entire life. His manager, Andy Green, bleeds Kentucky blue (and still holds his alma mater's all-time hits record). Those two schools met in the 2017 NCAA men's basketball tournament with an Elite Eight berth on the line. And Green's Wildcats came away victorious, 86-75. The next day, Hedges learned an important lesson: Never bet against your manager. After losing the wager with his skipper, Hedges wore a full Kentucky basketball jersey to the Padres' morning workout. The bet originally stipulated that he wear the gear, socks and all, through stretches. But Hedges' teammates loved the get-up so much they requested he wear it into the workout. As a freshman in high school, Austin endured one of the roughest baseball years of his life, scuffling at the plate and struggling to adapt to a higher level of play. A year later, he was MVP of his league and on course for a long pro career. Hedges credits former coach Joe DeMarco with his turnaround. On April 17, 2019, he gets the chance to repay DeMarco as part of the Game Changer Awards in San Diego. Hedges will be on hand to present DeMarco with his award, as part of a ceremony in Del Mar. The event is put on by Coaching Corps, an organization that provides youth from low-income communities with access to caring and well-trained coaches. DeMarco insists Hedges was always destined for big league success. He merely hoped to guide him toward it. "He was always a very driven kid who was very serious about being great," DeMarco said. "Even though he was skilled and a pretty good player, he never thought he had it all figured out, and he asks all the right questions." Hedges and DeMarco work together during the offseason, typically three or four times per week. DeMarco, who is president and COO of Elite Baseball, also serves as a hitting instructor for A's star third baseman Matt Chapman, who grew up with Hedges. June 2011: The Padres chose Hedges in the second round, out of Jserra Catholic High School in San Juan Capistrano, California. Hedges signed one minute before the August 15 deadline, for a bonus of $3 million. Josh Emmerick is the scout who signed Austin. Jan 11, 2019: Austin and the D-backs avoided arbitration, agreeing on a one-year deal for $2.060 million. Hedges has excellent baseball awareness. He hits for power. But he also knows when to move a runner over. And it is team-first for Austin. His bat lags behind his defense. But there is potential in his hitting ability. When he’s going well, Hedges employs a straightaway, line-drive hitting approach without an excessive number of strikeouts, and he could one day hit .260 with solid power production. Austin has good balance at the plate. He has shortened his swing and hits the ball where it is pitched. He hammers hard line drives to all fields with his compact swing. He doesn't chase pitches. He has a good eye. Hedge does best when he focuses on driving the ball to all fields. 2015: Reports continue to indicate Hedges could struggle with the bat in his hand, essentially limiting his ceiling as a professional catcher should he not “learn how to hit” at the big league level. He's doing a decent job of hitting the ball up the middle or to right field. Scouts almost uniformly view Hedges as a good bet to hit and an even better one to deliver extra-base power. The 2014 season was his second straight year of struggling at the plate. In the first half, Hedges hit .250/.300/.400 in 220 at-bats as a 21-year-old catcher at Double-A. And he looked for all the world like a future impact player. But his production trailed off drastically in the second half, however, as he collapsed his back side and began swinging uphill, possibly as he wore down in the Texas heat under the strain of catching 106 games. Catchers are tasked with running a pitching staff and sizing up other hitters. The defensive preparations and games can leave precious little time to work on their hitting. The prescribed remedy was to refine his swing, study video and bat against both Padres prospects and those with other franchises. “We’ll saturate the hitting,” Padres farm director Randy Smith said. After the season, the Padres mapped out a hitting program. It entailed tweaking Hedges’ swing path. He had become “too uphill” in his technique, Smith said. April 21, 2017: To the untrained eye, it's practically indiscernible, but Austin Hedges' current swing is not the same one he used when he started the season 0-for-24. The Padres noticed Hedges' hands moving a split second later than they had in the past—and after the rest of his body loaded to swing. "We showed him video, brought his attention to that," said Padres hitting coach Alan Zinter. "He was like, 'Oh, easy.' And he went out the next day and hit a home run off R.A. Dickey. He's been working on it since, just putting his hands back in sequence." The tweak, however minor, has paid major dividends, as Hedges is 7-for-20 with two doubles and four home runs. "My hands weren't in sync with my lower half," Hedges said. "It was really just about getting them all synced up. It wasn't a huge adjustment. It was very small. It's something I already did." As catcher, Hedges spends the bulk of his time game planning for that day's pitcher. He's renowned for his defensive prowess and his ability to work with a pitching staff. The way the Padres see it, if Hedges develops into a league-average hitter as a catcher, the rest of his game could carry him to All-Star status. 2018 Improvements: Hedges made his spring training debut Feb. 26, showing off his new swing. In an interview with The Athletic’s Dennis Lin, Hedges described his changes. As of the start of the 2019 season, Austin had a career batting average of .210 with 35 home runs and 104 RBI in 851 at-bats. Having Austin is like having another coach on the staff. He is going to have a big league career based on his defensive prowess alone. But, while his elite defensive skills distinguish him from other catchers his age, his bat needs to find another gear to allow him to contribute to a big league lineup. Hedges is an excellent defender across the board. And is also a solid pitch framer. Hedges does a great job of blocking pitches in the dirt. So his pitcher knows he can throw any pitch he wants at any time and not worry about if it is in the dirt. He has lightning-quick feet, he blocks everything, he shuts down the running game. He is intelligent. He has a knack for reading swings and calls a real good game. Austin is fundamentally-sound behind the plate., with exceptional catch-and-throw skills. He's a great athlete—good enough to play middle infield for his high school team—which helps him block balls in the dirt. He also has soft, but strong, hands that allow him to freeze pitches on the corners and give umpires a great look. Most scouts rate his receiving skills at 60 or 70 on the 20-80 scouting scale. It is clocked between 1.8 and 1.95 seconds, glove-to-glove. He impacts the running game with his ability to receive, his quick release and strong, accurate arm. He makes his pitchers better because they won’t worry about the ball getting by him. He blocks very well with his far-above-average catch and throw skills. Hedges has well-above average arm strength, regularly recording pop times around 1.85 to 2.05 seconds. "Nailing a guy and throwing a guy out, it's an adrenaline rush," Hedges said. "When I throw a guy out, it's the best feeling. I almost like that better than hitting a home run." In 2012, Austin erased 32 percent of Midwest League base-stealers. In 2013, Hedges caught 37 percent (35 of 94) attempting base-thieves in the California League. In 2014, Austin threw out a Texas League-high 50 base-stealers. He threw out 38 percent of base-stealers. In 2015, he threw 33% of those attempting to steal out, 16 of 49. In 2017, Hedges nailed 37% of runners—26 of 71 seeking a stolen base. 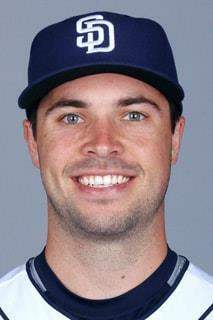 The Padres were elated to sign Hedges. "It's a combo of quickness I haven't seen at the amateur level, that defensive prowess," said Jason McLeod, assistant general manager of the Padres. "The quick feet, the quick release, the way he gets down [in his catching setup]." Agent Scott Boras, whose son played high school baseball with Hedges, said that Hedges reminded him of a young Ivan Rodriguez. He receives plus-plus grades for his quiet receiving, very impressive blocking skills, excellent footwork, quiet setup and leadership qualities. He receives the ball quietly—with very little movement, giving the umpire a better look. Austin calls his own game. The pitchers trust him. "I've called pitches since I started in pro ball, and I get a little better each year," Hedges said. "The pitchers are a little better, and they have a game plan as well. I think that makes my job easier, but it's definitely a learning process." Hedges said he tended to be a little too fast in his movements behind the plate. Ausmus worked with him to slow down. Strong technique and abundant confidence are apparent in the way he sets targets for his pitchers, receives the ball and shifts his feet while blocking balls in the dirt or firing missiles to second base. He records consistent 1.8-second pop times. Hedges used smooth footwork and an above-average arm to throw out 38 percent of base-stealers in 2014, and evaluators praise his ability as a receiver. Austin was asked why he chose catching as his position. "Right from Little League, I thought the equipment was neat. And I've always wanted to be in the center of things (in baseball)—being involved of being involved on every single play." Hedges draws praise for his handling of pitchers as well as his positioning and blocking skills behind the plate. “He does a lot of things that don’t show up in a box score,” Springfield skipper Mike Shildt said in 2014. Austin quickly established himself as a premier defender. In 2017, Padres' pitching coach Darren Balsley raved about Hedges' defense and his ability to handle the Padres' staff. In fact, Balsley already trusts Hedges enough that he's allowing the 24-year-old to essentially run the pregame meetings with that day's starting pitcher. "There's natural, extreme talent there," said Balsley. "He catches the ball great, has a cannon, is a good blocker, always has been. He does his homework. As far as our game plans are concerned, he's taken more responsibility in it when we have our meetings pregame. I actually let him run our pregame, and I'll add in when I can." To a man, the Padres pitching staff raves about working with Hedges, and recent results have backed his ability behind the plate. Hedges caught four consecutive quality efforts from his starters before being given Sunday off. "He puts in the work, watching the film and reading the scouting reports," said veteran lefthander Clayton Richard. "He knows the numbers and the game plan and he also knows the pitchers, our traits. There's a better bond between the catcher and pitcher because of all the knowledge he has." Said Jhoulys Chacin: "He's never out of the game. He starts 0-for-20 or something like that. But he's always doing something for the pitchers. He's always doing something to help the team. He wasn't thinking about him. He was thinking about the 12 pitchers that he has. That's something that you have to appreciate." The Padres only just handed him the keys to the position this past offseason. "Austin's the best defensive catcher in the game," said closer Kirby Yates. "There's nothing he doesn't do extremely well, from blocking to calling games to receiving to throwing." "He's as good as I've seen," added setup man Craig Stammen. "Austin's elite," said pitching coach Darren Balsley. "If he's not the best right now, then he's at least tied for first." Hedges missed 50 games in May and June of 2018 with an elbow injury, and his caught stealing numbers simply haven't been good enough this year. Still, Hedges ranks third in the National League in defensive runs saved, and his pitch framing numbers are once again excellent. "There's a lot of room to get better," Hedges said. "But I think my biggest strides have been from the preparation, pitch-calling, leadership role, with a lot of these young pitchers." His value is generally derived from the subtler aspects of the position. He's widely regarded as an excellent game-caller, and despite the time he missed, he ranks fifth in the NL in framing runs above average. "At the catcher position, the good ones are at their best when they're going unnoticed," Hedges. "If your pitchers are getting all the credit, that's exactly what you want." The reality is: Hedges is catching a pitching staff that currently features 10 rookies. They're still learning the intricacies of holding on baserunners in the big leagues. But Hedges has never been one to deflect blame. "I've got to get better at it," Hedges said. "I haven't been throwing guys out like I know I can. Some are in my control, some are not, but I need to get better. Austin has pretty good speed for a catcher. Hedges is aggressive on the bases and plays with high energy. April 16-26, 2012: Hedges was on the D.L. May 6-June 2, 2013: Austin was on the D.L. with ankle and knee injuries in a collision at home plate with Lancaster’s hulking Telvin Nash. There was also a deep bone bruise on his left hand, the result of being hit by a pitch. April 23-June 9, 2016: Hedges was on the D.L. with a hamate fracture in his left hand that required surgery. He was sidelined for about six weeks. July 18-30, 2017: Austin was on the DL with a concussion. May 1-June 24, 2018: Austin was on the DL with right elbow tendinitis.